Over the years many people have been struck by the magnificent tulip poplar that towered beside Jefferson's house. I remember standing in awe under it, gazing at the impressive girth of the trunk and the massive spread of the branches above, and noting the cables running throughout it. So I was stunned to read in the Daily Progress on June 25, 2008 that the tree was going to be taken down. The tulip poplar had long been considered an “original” tree dating to the lifetime of Thomas Jefferson because of a notation in his Garden Book made April 16, 1807: “planted 1. Laurodendron in margin of S.W. shrub circle from the nursery.” This places a tulip poplar in the vicinity of the recently removed tree, whose size also suggested a long existence. 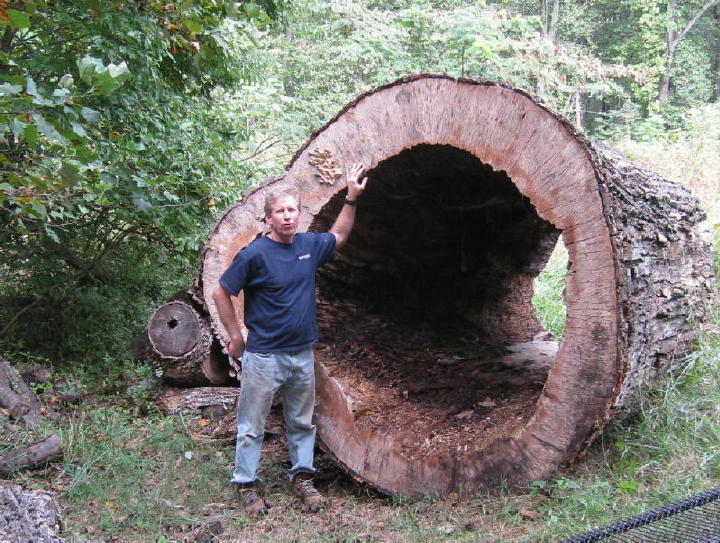 Exactly how old was the tulip poplar? 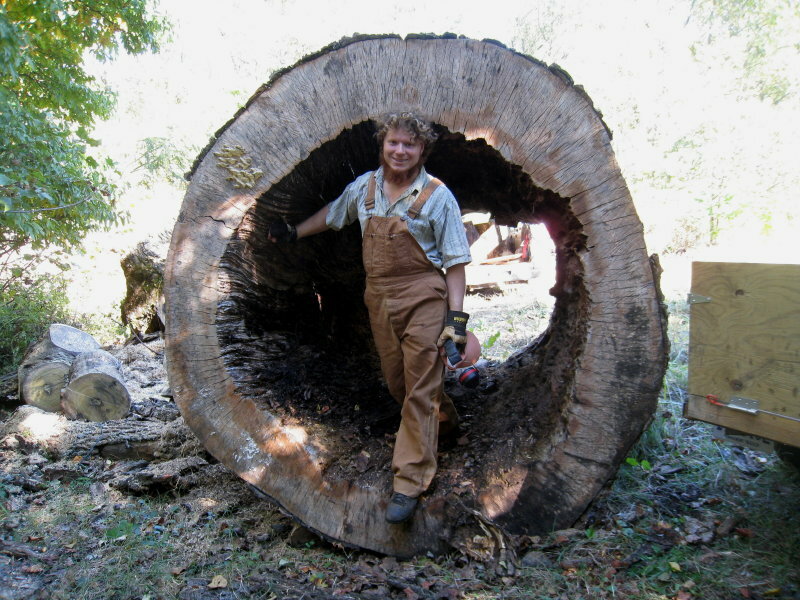 The age of trees can usually be determined by taking core samples from the trunk and counting the growth rings. 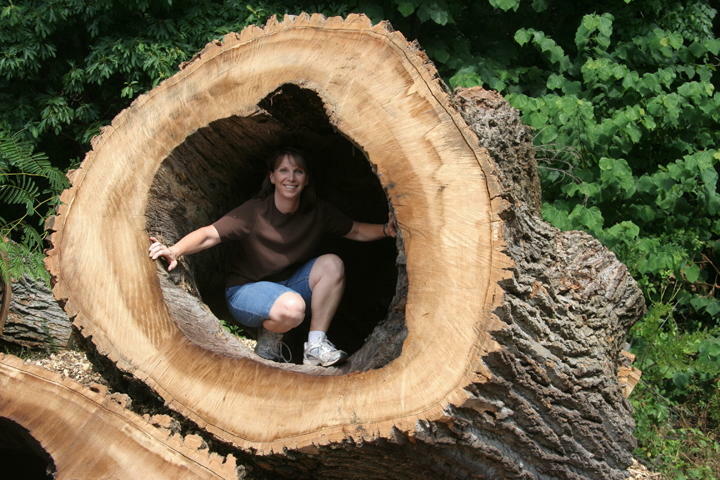 With the tulip poplar, however, ring counting was not possible because the trunk had been hollow for more than a century and live wood comprised only 17 percent of the trunk’s circumference at the base of the tree. On the other side of the coin, arborist George Van Yahres wrote in 1926 that the tree was not “original,” and restoration architects under the direction of Fiske Kimball in the early 1940s also discounted the tree’s Jefferson connection. Early photographs of Monticello taken in the late 1800s offer no conclusive evidence. There is also the possibility that the tulip poplar that lived into this century was a “successor” to the tree noted by Jefferson in 1807 and dated from a later period in his life, perhaps the early 1820s. 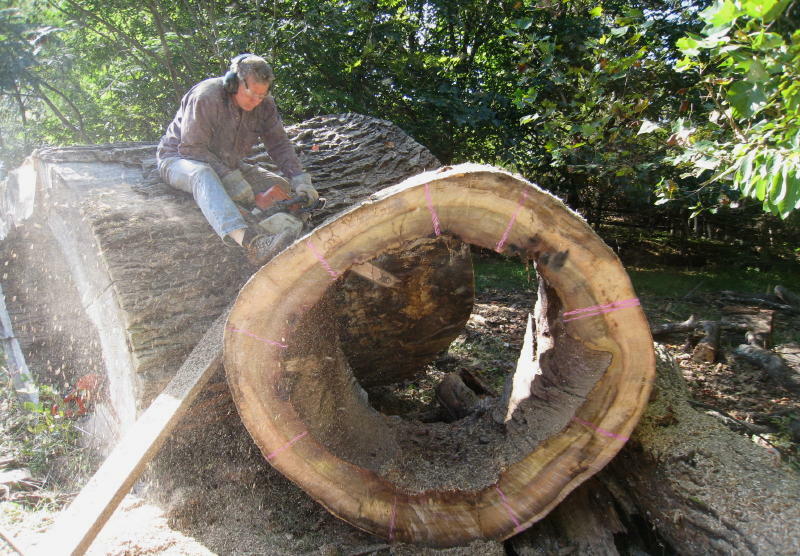 During the 20th century, many efforts were made to preserve the tulip poplar. The tree was “topped” at about 40 feet around 1900. In the late 1920’s, Van Yahres pruned the tree to create the four “fingers” of limbs that defined it’s shape for more than 80 years. IN 1978, Van Yahre’s son Mitch Van Yahres directed the pruning of the tree’s canopy to enhance it’s wind reisitance by eliminating the “sail” effect of dense foliage. He cabled the tulip poplar and it’s twin on the north side of the house to other large trees to prevent them from falling onto the house in the event of a powerful storm. In 1997, concerns about the structure of the tulip poplar resurfaced. One consulting arborist recommended that it be taken down immediately. Instead, the tree was preserved through the installation of an internal system of flexible cables devised by Don Blair of the M.F. Blair Institute of Arboriculture in Big Pool, Md. 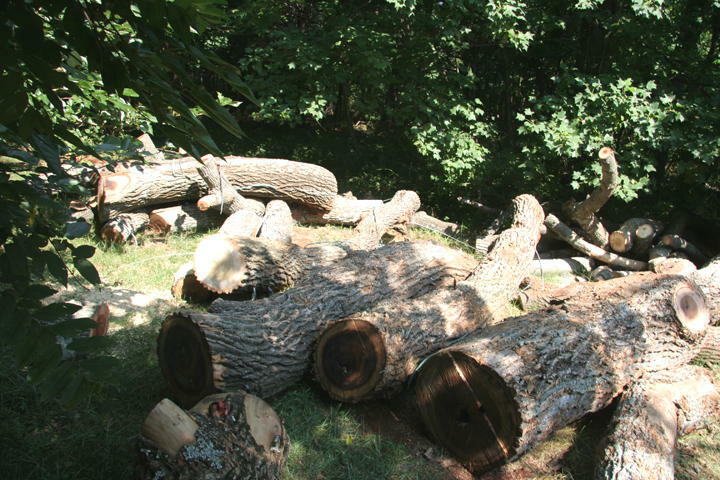 Despite all these preservation efforts, the tulip poplar’s health had declined sharply in the past two years. It's root system was compromised by age, restricted space, and the root disease Phytophthora. The foliage of the tree had become so thin that the limbs were being scalded by the sun, and the wood of the tree was drying out and becoming increasingly brittle. Concerns about the structural integrity of the tree prompted the decision to have it removed. 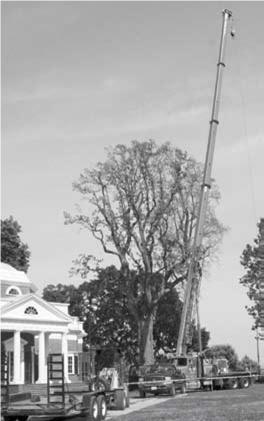 The complex task involved the use of a 90-ton crane and was accomplished the evenings of June 25 and 26 by a crew of arborists from Bartlett Tree Experts of Charlottesville. “We’re grateful that this ancient tree lasted as long as it did,” said Peter Hatch, Monticello’s director of gardens and grounds. “We also need to be thankful that such an enormous living thing, with the potential to cause irreplaceable damage to life and property, was removed systematically by man and not recklessly by nature.” Plans for replacing the tulip poplar are under consideration. Hatch said Monticello possesses small specimens– both grafted (or cloned”) trees and seedlings (saplings from seeds of the tulip poplar) – that eventually could be used for replacement. For a podcast featuring Peter Hatch on the tree, click here. I had done some prior work for Monticello, starting in 1997 with some architectural turning, and including making some bowls out of a Carolina silverbell and a copper beach that had to be taken down. Pieces were bought for board members and such, and I was able to sell the rest, but not to market it as Monticello wood. So a couple of weeks later I contacted them to see if there would be any chance of getting some of this wood, and was told they had already made arrangements with a Historical Woods company. I asked to remember me if there was any left over. And in early August I got a call to come up and take a look, and that I could get a van load to work with under the same arrangements as before. I would give first choice to Monticello, at a reduced price, and then I could sell the rest, but again not featuring the Monticello Tulip Poplar name. This was some tree and some logs! Me by the base of the main log. Even the branches were huge once you got close. Note the lightening cables visible here and there. I was immediately struck by the surface of that inside hollow, how burnt and ragged it looked from a century of exposure to oxygen and air, out of the sun. I decided to focus on that, and took one section from the big log plus some pieces of the upper branches that were hollow and some of the off-cuts from right above the ground. The van was sagging to the ground when I drove away. The wood was remarkable to work with, much harder than any poplar I'd experience before, and with an immediate sense of age to it. The blacked inner hollow surfaces was especially tough, fire-hardened I liked to think, and provided the most distinctive bowls when featured as the upper edge. I turned most of it over the fall, sold a number of pieces to Monticello and staff members, and the rest to the general public at my studio and at some shows. I have always felt that my bowls essentially preserve a bit of the soul of a tree. They are thin curved sections through the wood, often going from heart to bark, dried and polished smooth, and in the arcing surface you can read the history of the tree as well as see some of the stresses it might have undergone. Once completely finished and put in a house, they can last forever. When I noted that the few pieces I had left into the summer of 2009 had deteriorated noticeably, I contacted Monticello again to see if there was any way to work out using more of it before what was left began to really rot. I got in touch with Peter Hatch, who agreed to let me have all the branches if the work were made available to the Museum Shop. I met with the director Sharon McElroy and showed her some of the work I'd done, and we worked out an agreement where a portion of all sales go to the Thomas Jefferson Foundation education program. All pieces will be numbered and documented, and signed "Monticello Tulip Poplar." I can sell some myself directly, but most will be sold through the Museum Shop. So I went back up to get all the branches, and when Peter Hatch came down to check it out and talk about the remaining big logs, he allowed me to take the "smaller" trunk section. 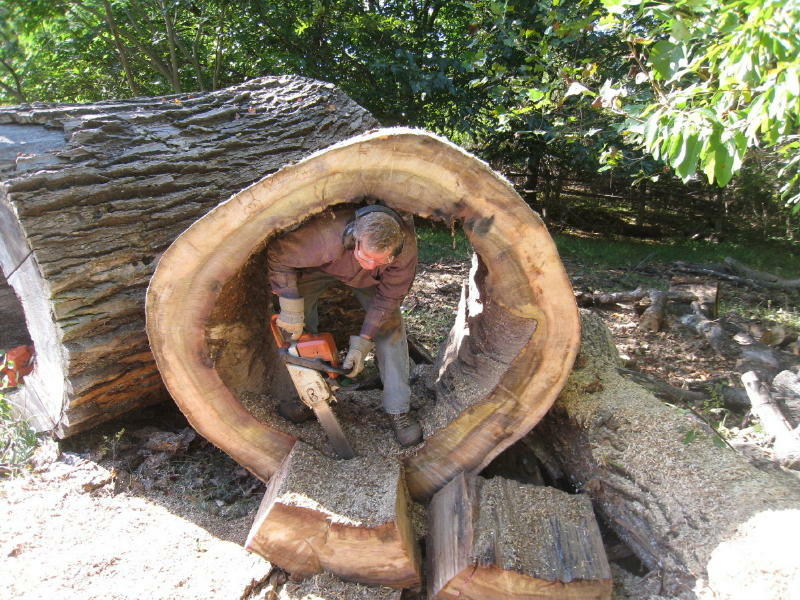 The biggest one as well as the fabulous hollow crotch sections are to be set up as display pieces on the estate. This time I blocked them into more manageable sizes. The wood was much lighter, dryer. Note spalting starting under bark. The Monticello Tulip Poplar bowls are sold primarily by the Monticello Museum Shop. There are two other turners working with the wood. Each piece is numbered sequentially by the artist, documented by photograph, and is accompanied by a certification card from Monticello. Sales have been brisk over the years as people can appreciate the sense of history they get with these elegant sections of the tree. You may contact the Museum Shop at 434-984-9840 or 1-800-243-1743 to check for availability if you are interested. The multiple vanloads I got are nearly gone. There is a limited quantity of big branch sections left, and two final sections from that fabulous hollow trunk that yields the dark edges. There is such a sense of the special antiquity with this wood, and it is such an honor to work with it and a challenge to do the very best with each piece. On November 18'th the Daily Progress ran an article on this use of the Monticello tulip poplar titled "Turning History into Art," by Sharon Fitzgerald. The guitar makers Huss and Dalton were given a few pieces to work with. You may see their results at http://www.hussanddalton.com/news.html, and a brief write up at http://www.virginialiving.com/articles/regal-tree-historic-sound.